Raleigh is the capitol of the state of North Carolina, as well as the seat of government for Wake County. 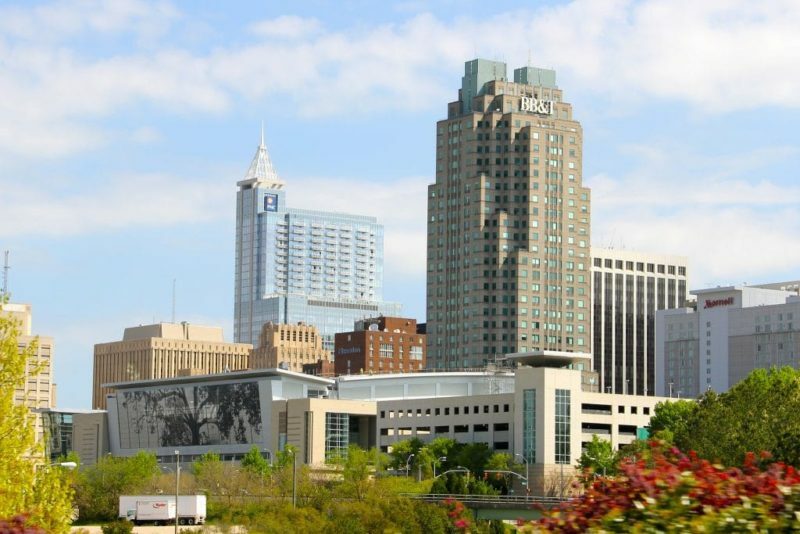 Raleigh is the anchor city of the Research Triangle region, along Durham, Cary and Chapel Hill. Raleigh is dubbed “The City of Oaks”. Raleigh’s urbanity is on display in the exhibits at the North Carolina Museum of Art for its many oak trees. Raleigh, for most of its history, was a sleepy Southern town. The city is the namesake of Sir Walter Raleigh, a cohort of England’s Queen Elizabeth I. He was instrumental as the sponsor of colonization of the New World, particularly North Carolina and Virginia. The city history began with the formation of Wake County in 1771, named for Margaret Wake Tryon, wife of Governor William Tryon. Raleigh was chosen as the site of a new state capital in 1788. It was officially established in 1792 as both the new county seat and the new state capital. The city’s location was chosen, in part, for being within 11 miles of Isaac Hunter’s Tavern, a popular tavern frequented by the state legislators. No known city or town existed previously on the chosen city site. Raleigh is one of the few cities in the United States that was planned and built specifically to serve as a state capital. Check out Raleigh scools on GreatSchools.org. To search by a specific school in Raleigh click HERE. Also Don’t miss the State Farmers Market. The city has great transport links with I-40 and I-540 in the city giving access to local cities and the mountains and coast beyond. Research Triangle Park is a short commute from most of Raleigh as is RDU International Airport. Where to start? Raleigh has everything, Pro Sport, College Sport, Concert Venues, Theaters, Museums, Historic Sites and so much more! Raleigh is home to many parks including the 5579 acre William B Umstead State Park. Pullen Park is a kid friendly park near NC State University. Also coming soon is the 308 Dix Park, it will be a destination park close to downtown. The Kevin Lingard Team are a group of full time, professional, real estate agents. As a result they are committed to helping you find your perfect home in Cary, Apex, Morrisville, Chapel Hill or any of the other great Triangle communities. Their aim is to make your move as smooth and worry free as possible.